Since 7 January 2011 it has been my pleasure and privilege to compile and send out the War In Angola Newsletter on a weekly basis. Each weekly issue consists of 10 pages of articles (and sometimes a Map or two) relating to the War In Angola, and includes a page dedicated to the coming week's events, the subscription page, and a page listing the last week's posts on the various Forums of this website. Sponsorships have come and gone, but it has so far been possible to allow each and every Registered User of the War In Angola website to access and download their choice of Adobe PDF file, from the Smallest File Size, the Standard Size, The High Quality, to the Press Quality format. 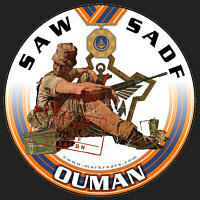 Each Volume comprises of a collection of 26 weekly issues which have been published within a six month period and each Volume will also be available as a full colour PRINTED EDITION hardcover book containing over 310 pages which also included extras like a full Contents, 26 hand-drawn colour plates of SADF Equipment, a 20-page Glossary of Terms, Abbreviations, and Codes used in the Newsletters contained within that particular Volume, as well as a 20-page detailed Index covering the subjects, events and names discussed in the Newsletters.